Jim Shankman and Steven Mark Friedman in The Screenwriter Dies of His Own Free Will. Photo by Hunter Canning. BOTTOM LINE: Male egos spar in this witty and fast-paced, if slight, comedy. 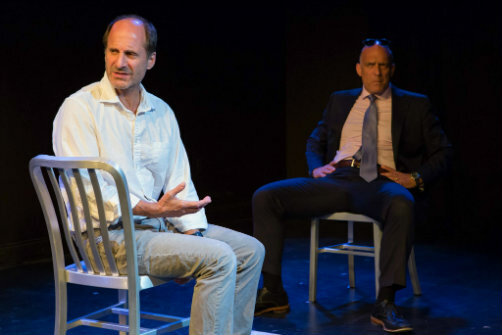 Writer-actor Jim Shankman plays Willy Shotz, famed author of thrillers and science fiction classics in the 2015 FringeNYC award-winning comedy, The Screenwriter Dies Of His Own Free Will. Schotz’ considerable creative output might be enough to satisfy some folks, but not him. In fact, now that his time on earth is ending—he has terminal cancer—he’s filled with angst and is hoping to beat the clock so that he can enter the Pearly Gates with something more substantial on his resume. Schotz just so happens to have a meaty “art house comedy” in hand, a script to present to his long-time agent and nemesis, Gabe Weiner (played with smarmy charm and perfect comedic timing by Steven Mark Friedman.) As the two men exchange verbal barbs it becomes clear that theirs is a long-standing rivalry and their back-and-forth banter is neither new nor unexpected. Indeed, they’ve been at it since they were 15 years old and Willy won the affection of the mutually coveted Missy Haggerty. It subsequently carried over into their Princeton years where they continued to be college antagonists. The end result is a funny, ridiculous, and more-or-less believable dance between love, hate, and neurotic second guessing. At various points the pair’s rapid-fire shtick is interrupted by one or the other facing the audience and drawing us into the narrative. This, too, becomes food for contention: Are the spectators being forced to choose sides? Can either man be certain that the audience will be objective? And can they trust each other not to bribe the viewers who are gaping at them? The spare set—two silver metal chairs, one hanging light fixture, and stark white walls—keeps the focus on the actors as they wound and cajole one another. The only embellishment comes from occasional pre-recorded sounds (designed by Craig J. George) to make time and place a bit more vivid. It’s an entertaining whirlwind, precise and sharply-written, if slight in its tragi-comedic worldview. Throughout, I found myself wanting more: more depth of character, more personal history, and more grappling with the loss of life and friendship, however fraught. But I may be in luck. According to Shankman’s Playwright’s Note, an expanded version of The Screenwriter Dies... is now available, and at ninety minutes it will likely fill in the gaps. I look forward to seeing it. The Screenwriter Dies Of His Own Free Will was written by Jim Shankman and directed by Craig J. George. Stage Manager is Annabelle De Meo. Lighting Design is by Jason Zanitsch. Sound Design is by Craig J. George. The cast is Jim Shankman and Steven Mark Friedman.